A monumental sculptor, he was born in Ardrossan, Ayrshire, on 1 January 1815, the son of a carter, James Wood, and Agnes Rodger, and was baptized on 29 January 1815. He was the older brother of the Greenock based monumental sculptor, Thomas Wood (d. 1867). Known as Bob, he trained as a sculptor in Glasgow, at the Antique Academy and the School of Design ( GSA ), under Macmanus, and was a close friend of the Mossmans . In the 1840s, he worked as a Journeyman Mason and operated from a workshop at 72 St George's Place, from 1845, then moved to 6 Cathedral Street, and later to 141 Dundas Street. He eventually moved to Greenock in 1849, where he set up his workshop at the gates of the newly opened Greenock Cemetery, at 42 Inverkip Street, employing four men. As well as his monumental work, he produced portrait busts, of which William Mossman II noted that: "he has always three or four on hand and [gets] five and six pounds for each". His cemetery monuments were often large-scale and elaborately carved. His finest work in Glasgow is the monument to the Glasgow Fire Master, William Robertson, in the Eastern Necropolis (Janefield Cemetery), which features a carved relief of a contemporary fire engine (c. 1845). 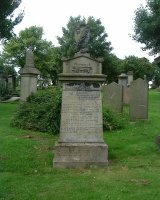 Amongst his identified work in Sighthill Cemetery is the monument to Archibald McQuarrie (1847). 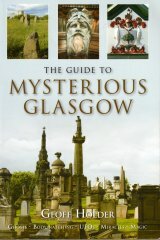 His best work is in Greenock Cemetery, for which he carved the colossal, multi-figure Gothic spire to Walter Bain, which features a portrait bust under its canopy (c. 1850). Wood died at the age of 40, on 10 June 1856, of Typhus Fever, which he had suffered for ten days, his death being registered by his brother, Thomas (Wood was unmarried). He was buried in Greenock Cemetery. His business was continued at the cemetery gates by his brother, who originally worked from 9 Bruce Street, employing two men and two boys, until his own death on 1 July 1867.